With decades of collecting behind me, the coffers are full. 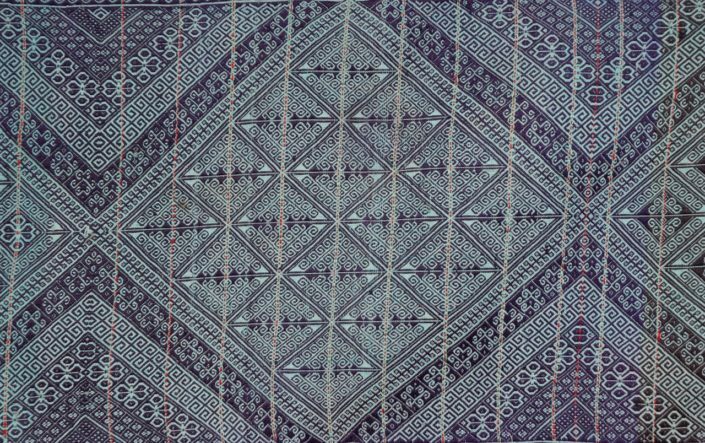 There are more from material I gathered myself while traveling in Laos, Nepal, Afghanistan, Burma, Bolivia, Columbia, Uzbekistan. Some garments, many flat items, various fibers, constructions, and techniques are included. 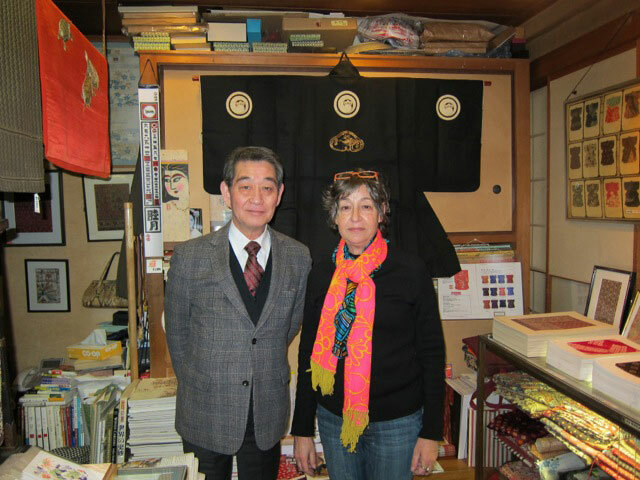 My long residence in JAPAN while creating an initial collection of modern kimono for the British Museum started a new quest. 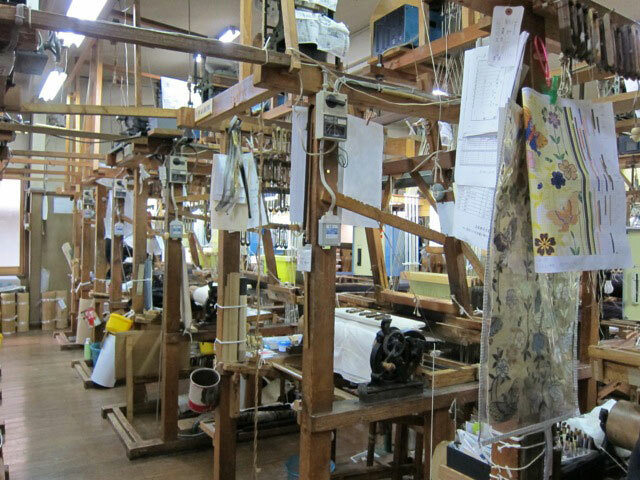 Following my return to New York, I’ve returned for one month each year to visit makers and gain knowledge. 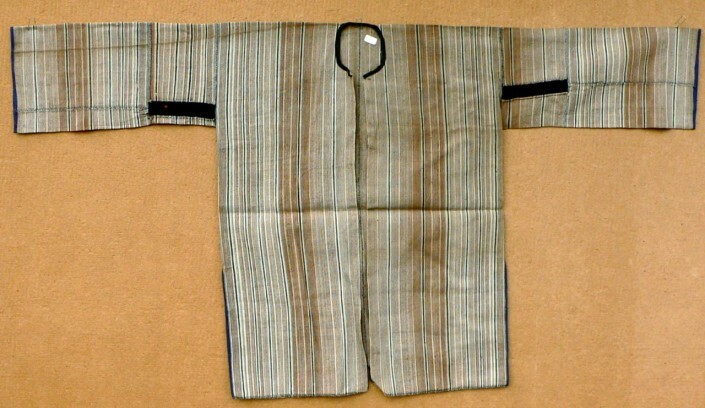 I now own a shifting collection of about 600 garments and accessories which I must thin down. 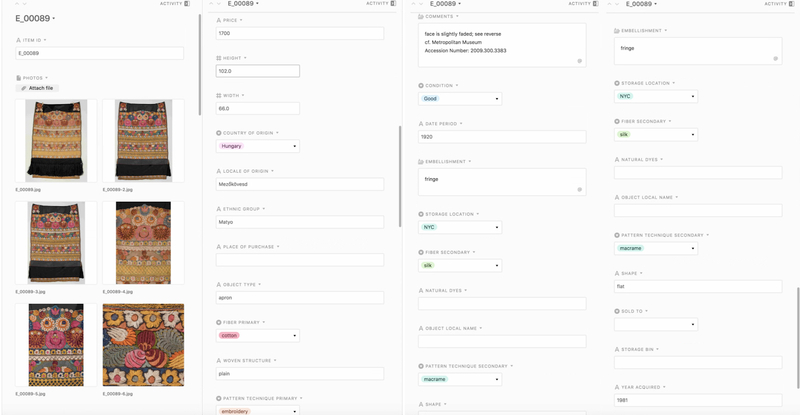 Read a bit more and check out examples in the store. Most material is not available online, but requires an inquiry and follow-up via a shared screen presentation of a group I will select individually based on your interests. 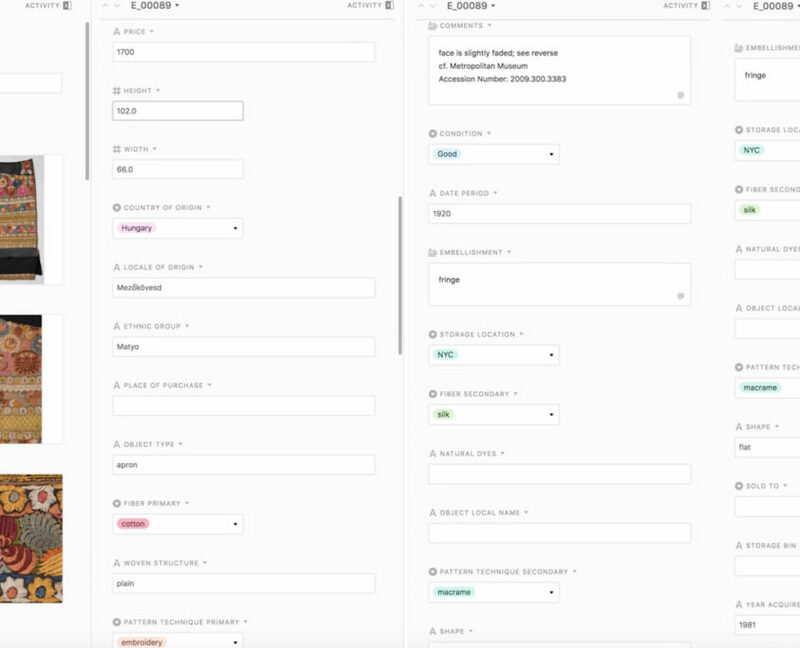 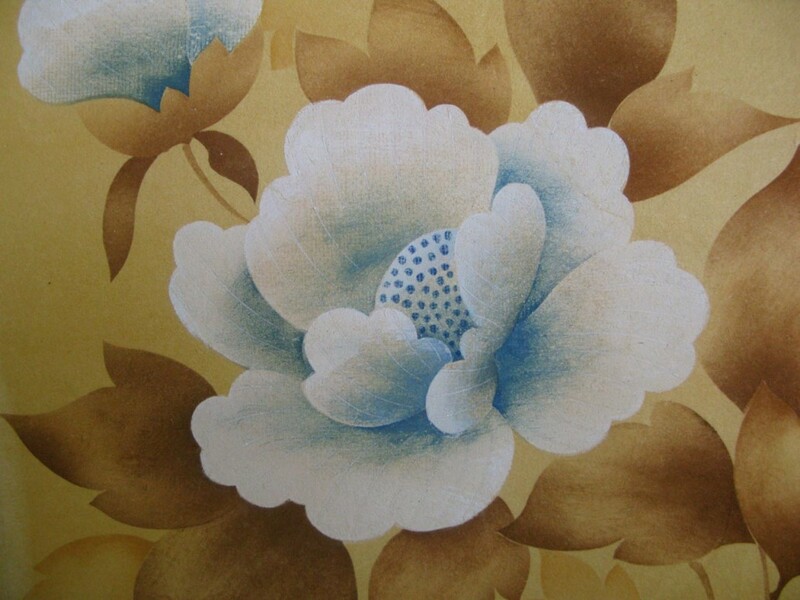 Some few items are listed in the store on this site and others will be suggested by blog posts. In the midst of the Dakota Transit business in New York City, I took a month’s vacation to Peru and feel hard for the slow way of life and a chance to learn about construction and meaning of personal textiles. 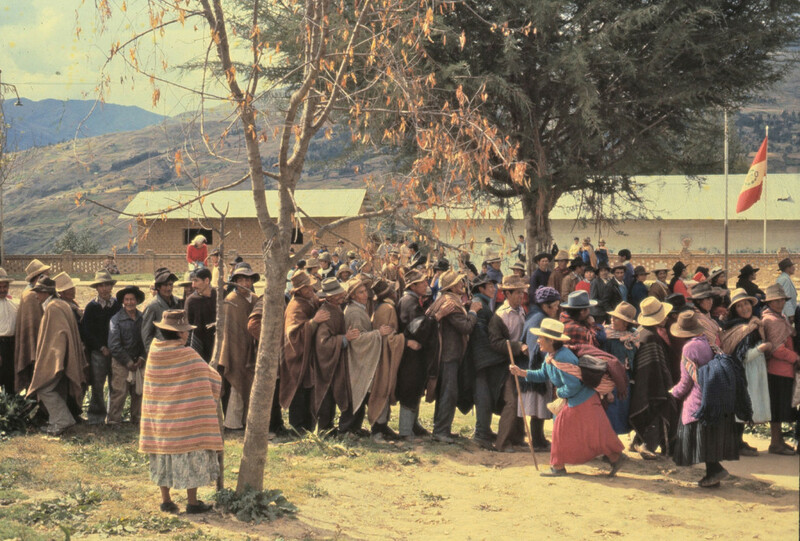 I was the specialist at the Ministerio de Cultura and thus spent time in various communities, both coastal and mountains, but it was the central area of the Andes which beckoned most: hand spinning of both sheepswool and alpaca, knitting, crochet, tapestry, and backstrap loom weaving: a plethora of material as well as the traditions of everyday and festive wear. In this zone, seven hours east of Lima, I settled with my family for five years. At its heart is a commercial city surrounded by a rich agricultural valley where Spanish is widely spoken and the culture clearly mestizo. 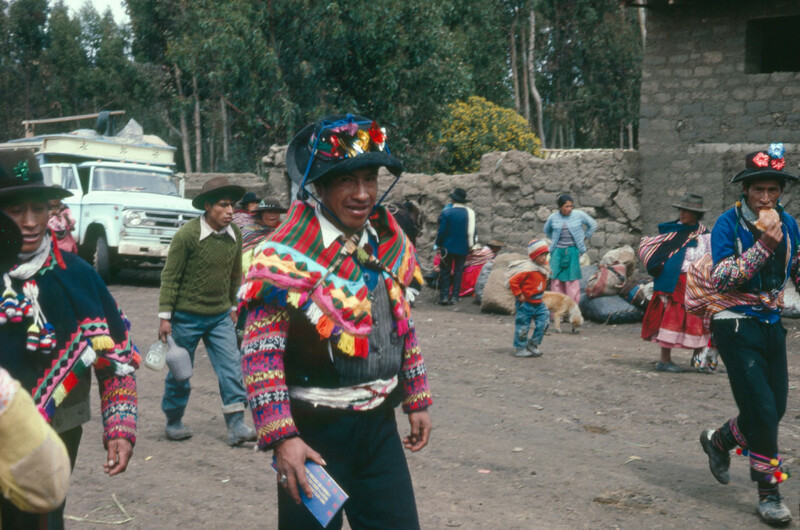 The perimeters elevate to zones well above the treeline and were populated by Quechua-speaking families of high altitude herdsmen and miners. 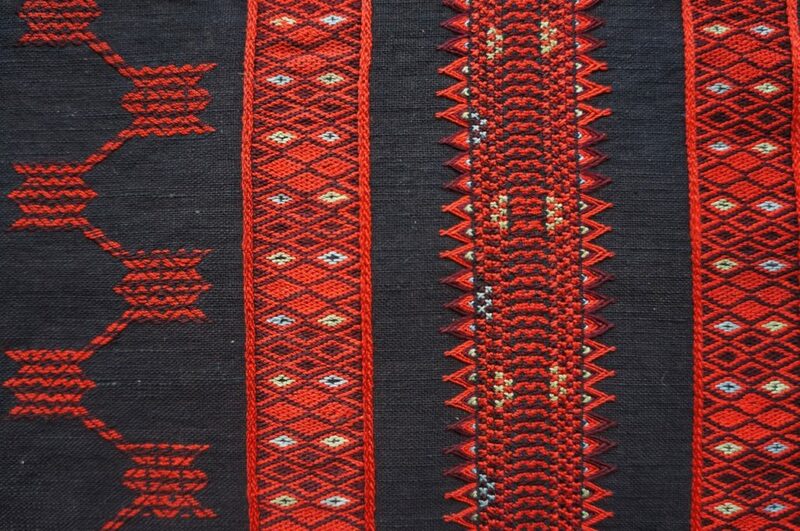 It is also the only part of the country where weaving is still produced on tapestry as well as backstrap looms. 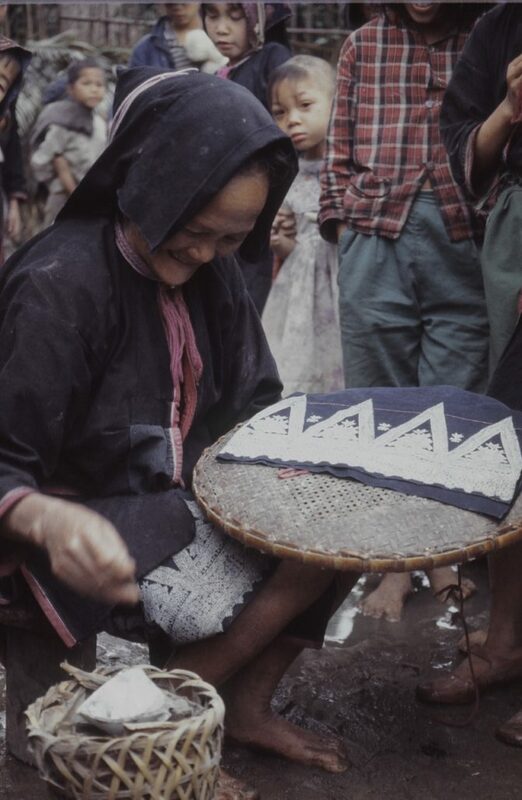 Additional techniques are used to make a glorious variety of garments and accessories for both everyday use and costumes for the dances during holidays. 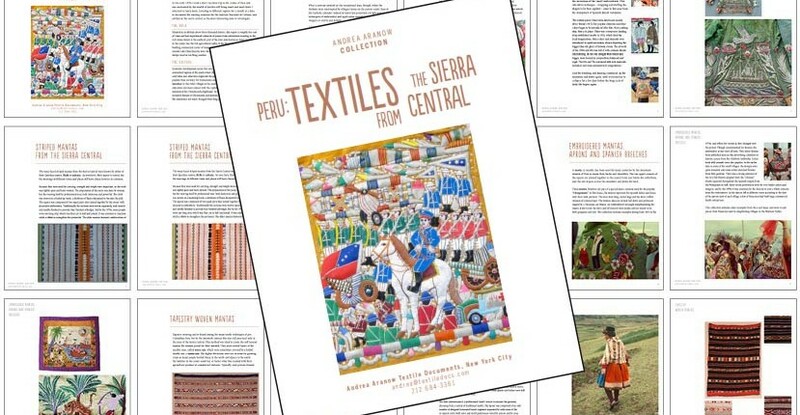 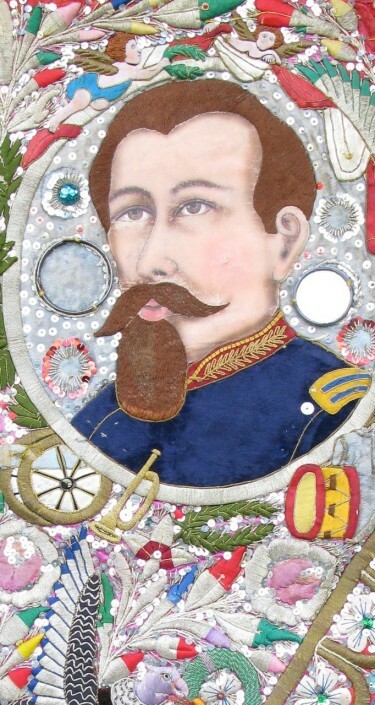 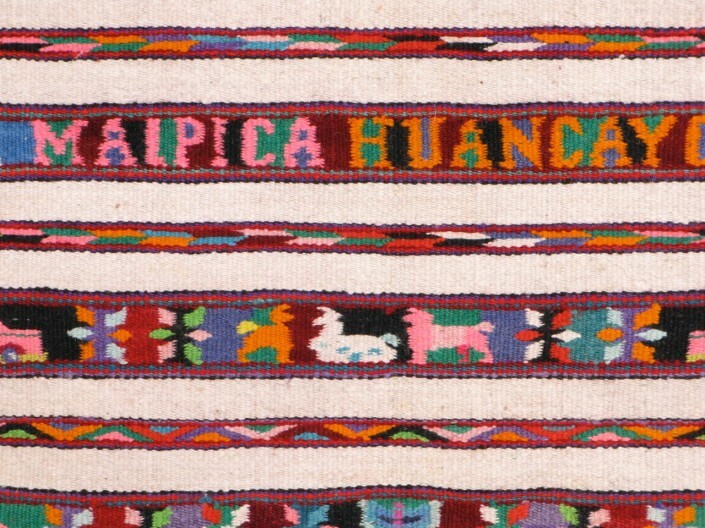 The textiles and toys from the Sierra Central comprise the largest section. 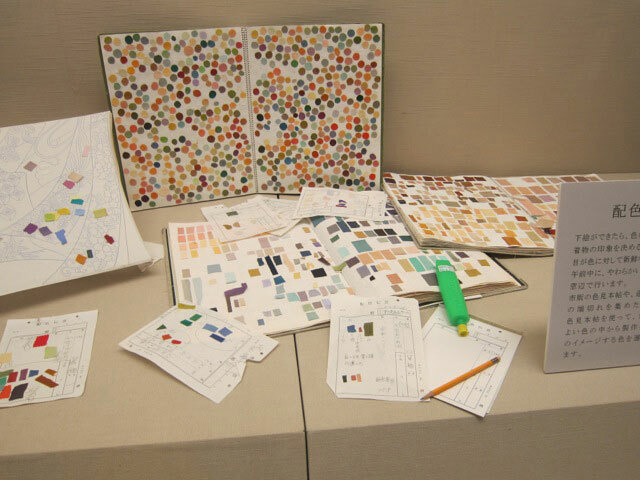 Numbering over 600 pieces, there are four groups described and pictured in a presentation document. 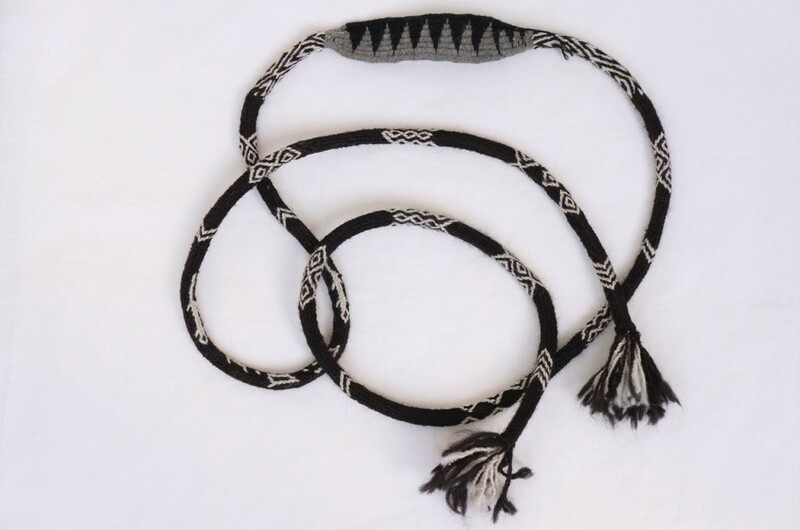 Another notable component not yet written up is the collection of accessories from Huancavelica, including braided slingshots from sheep’s wool or alpaca, men’s knitted socks, sleeves and inner hats; crocheted hip wraps and woven garters, belts, baby-wraps. Several hundred similar pieces were purchased by The British Museum in 1981 and those photographed thus far are shown on their website though few of these objects have been exhibited or published. From the Southern Highlands are some 50 twentieth-century items. 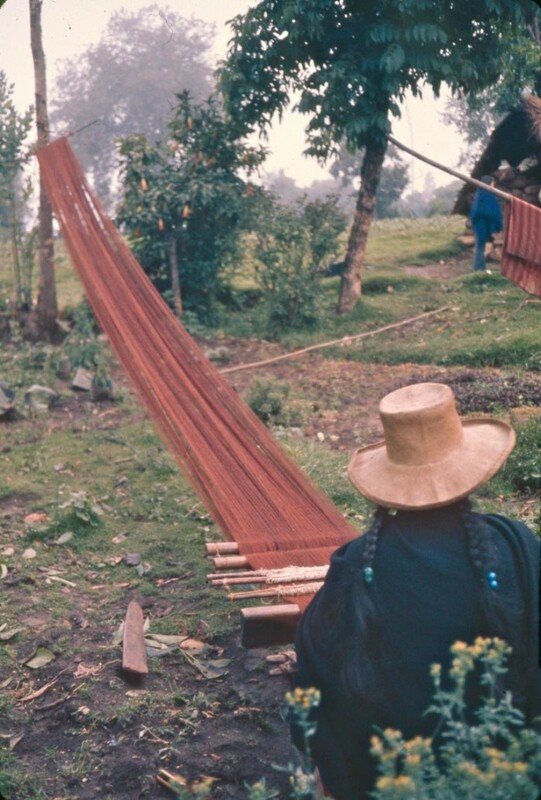 The yarns are hand spun & plied from sheep’s wool or alpaca and the weave technique is backstrap. The group illustrates the variety of designs still existing in neighboring villages. 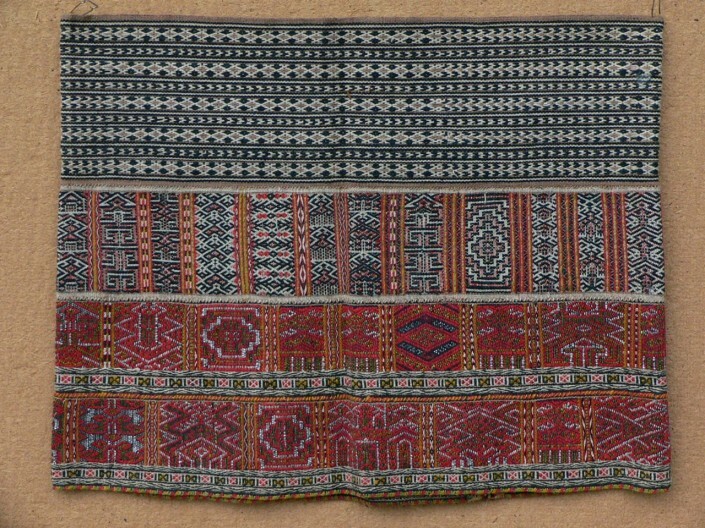 Ponchos, belts, inner caps, coca bags and wraps for larger loads use patterns and colors (mainly aniline) traditional to their respective villages. 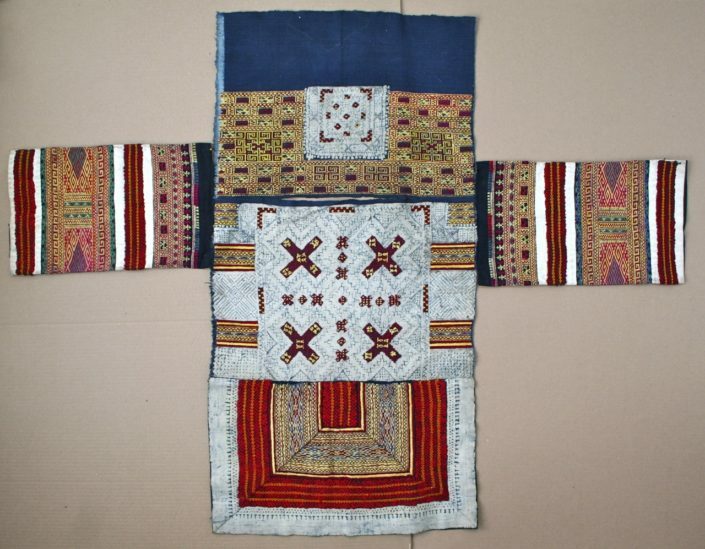 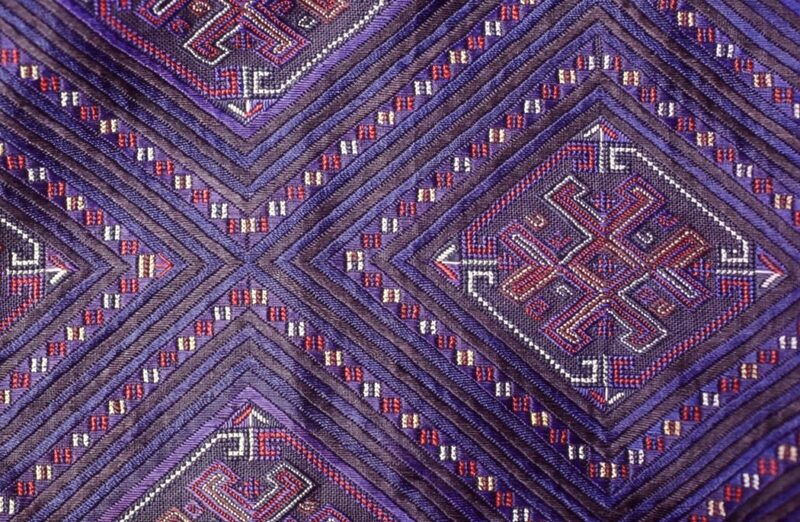 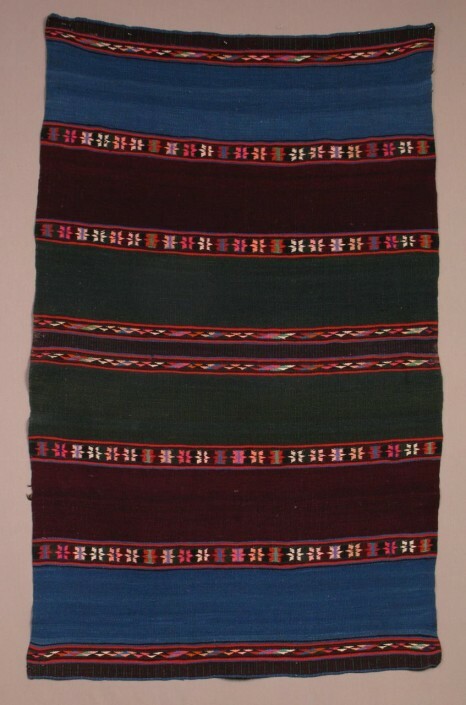 The Northern zone of Peru, here represented by textiles from Lambayeque on the coast and the highland of Cajamarca, was early and easily penetrated by the Spanish. 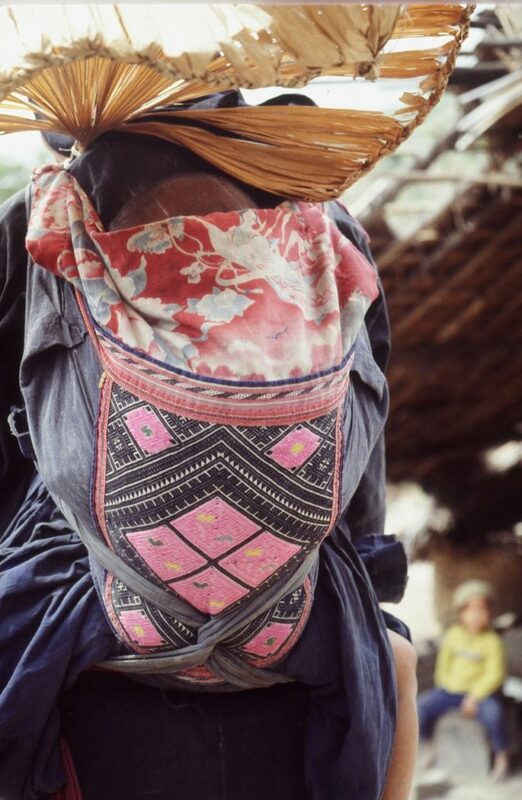 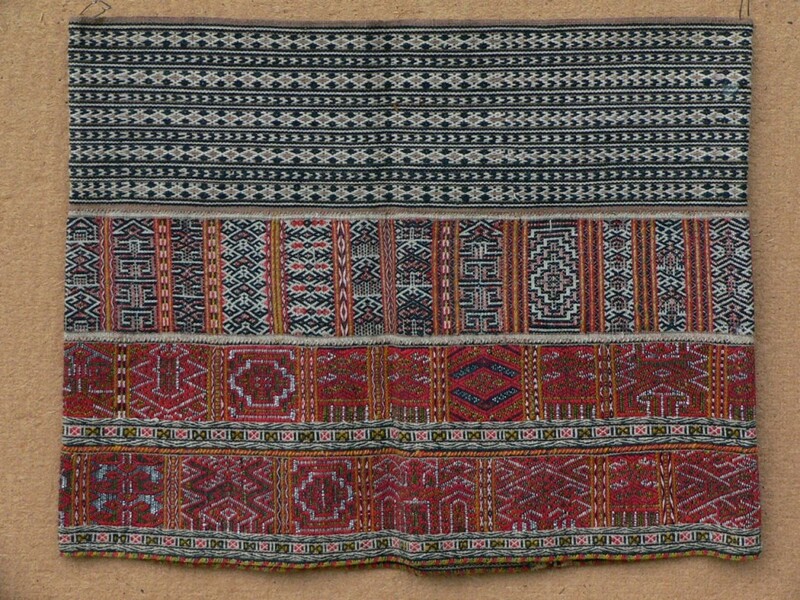 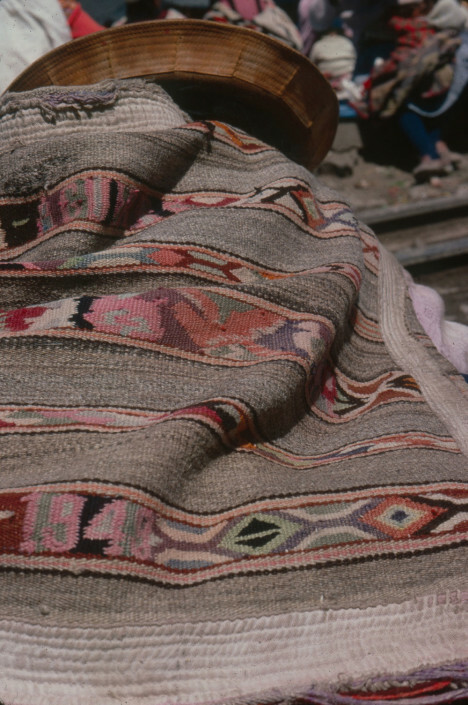 Two imported forms, saddlebags and shawls, still dominated the handwoven sector in the 1970s. Coastal bags range from those used by pack animals to smaller ones carried as personal accessories, with designs copied from commercial cross-stitch books and further adorned with woven dates and owner’s names. 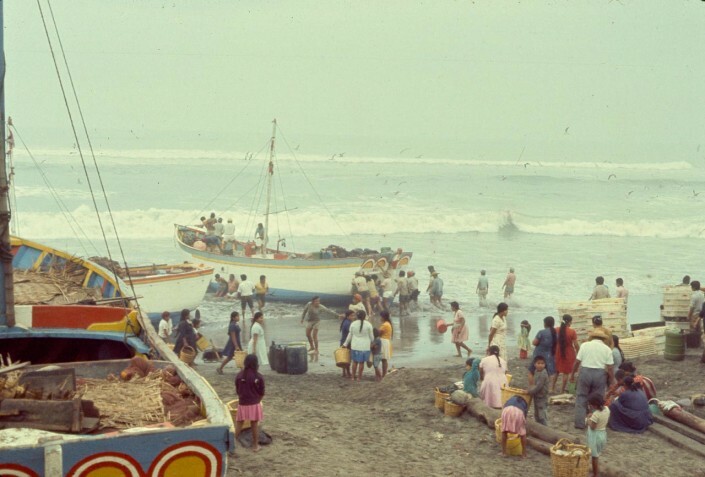 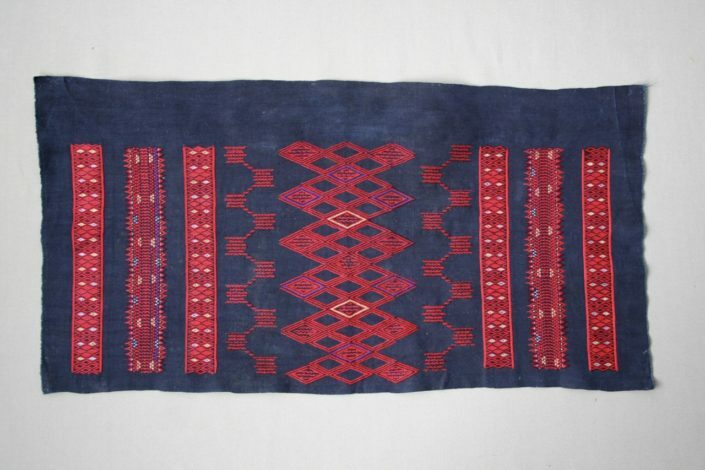 Also included is a group of fishermen’s sheets in natural brown shades of cotton, grown locally in the coastal desert.The indigo and white cotton ikat shawls with elaborate macrame are outstanding triumphs of Cajamarca. The adjacent area of Galisteo, Ecuador shared a similar production. 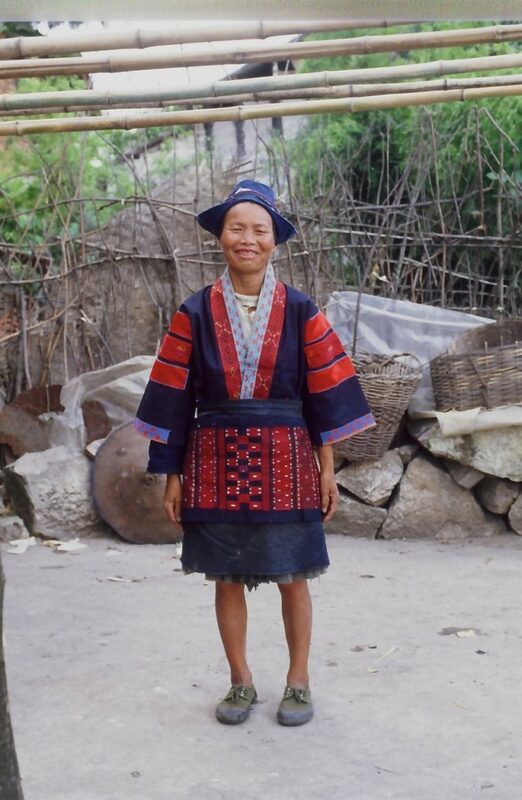 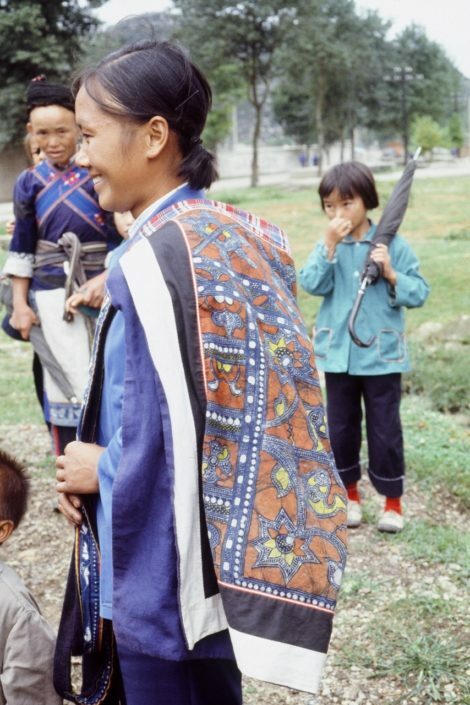 I arrived at Hainan Island for the first time late 1983, having already spent several months in China visiting hamlets of different minority groups in the South and Northwest. 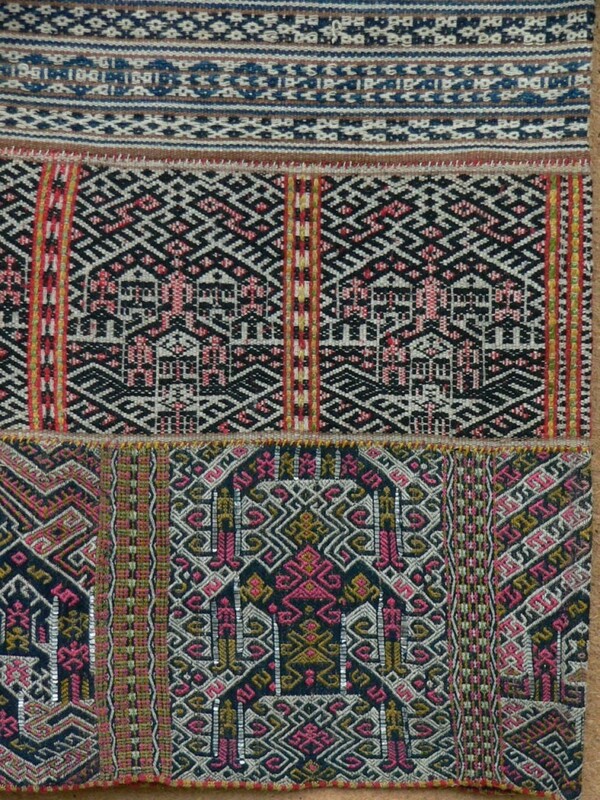 I had no inkling of the massive change which would occur once the island was designated a special economic zone., but the variety of techniques and complexity of motifs were unlike any I had seen. 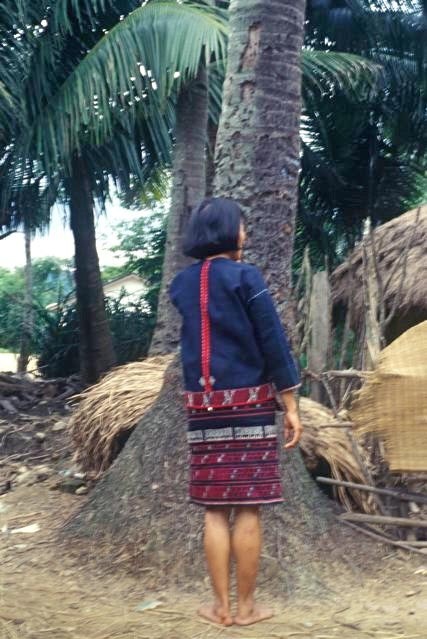 Collecting was slow and I suffered between the tropical humidity of the lowlands and the thorny paths leading up to the backcountry hill communities. 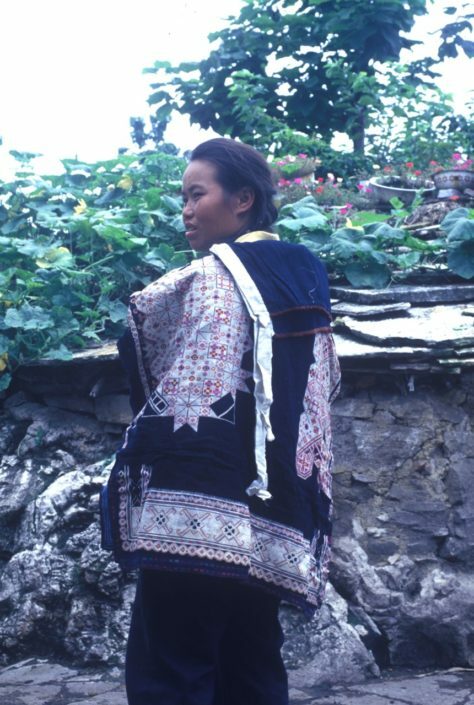 But with four further trips over the following years, I eventually covered all of the Li territory on the island. 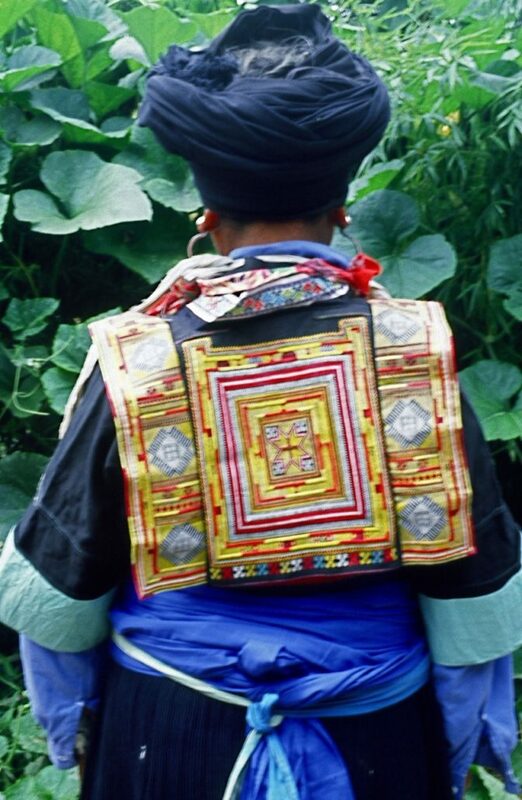 Scholars name the Li as the original inhabitants of Hainan Dao, preceding the ethnic Han people who had come to dominate much of the coastal zone after centuries of trading along the spice routes. Though separated into several linguistic subgroups, all practice a reverence for ancestors which includes keeping clothing in beautifully fabricated tight basketry containers stored under the eaves. 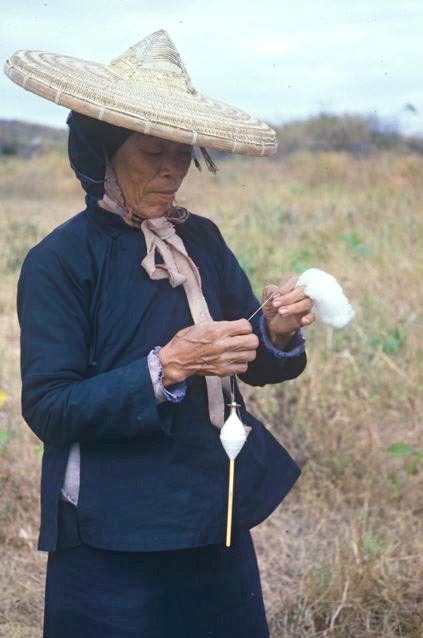 The fibers used include wild silk, kapok and cotton, hemp from the highlands where currency was scarce, and industrial yarns purchased in more commercial areas. 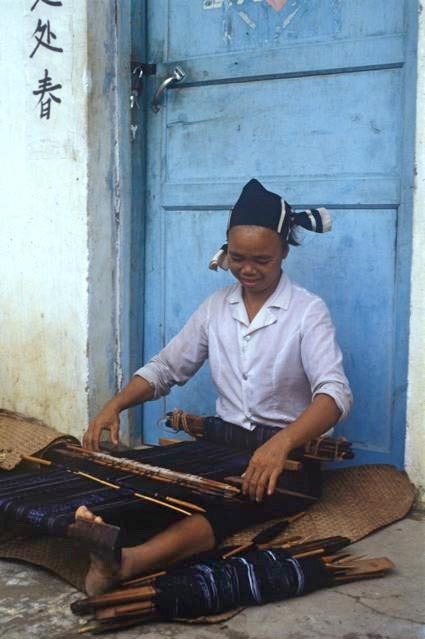 Styles vary by region with ankle-length sarongs worn in some places and just a narrow hip wrap in others. 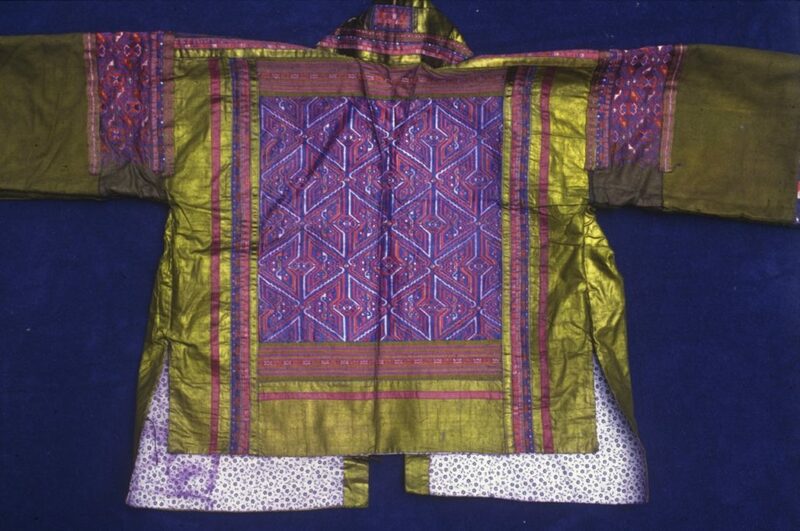 The decorative aspects of the women’s shirts are more conspicuous than the style of fabrication. 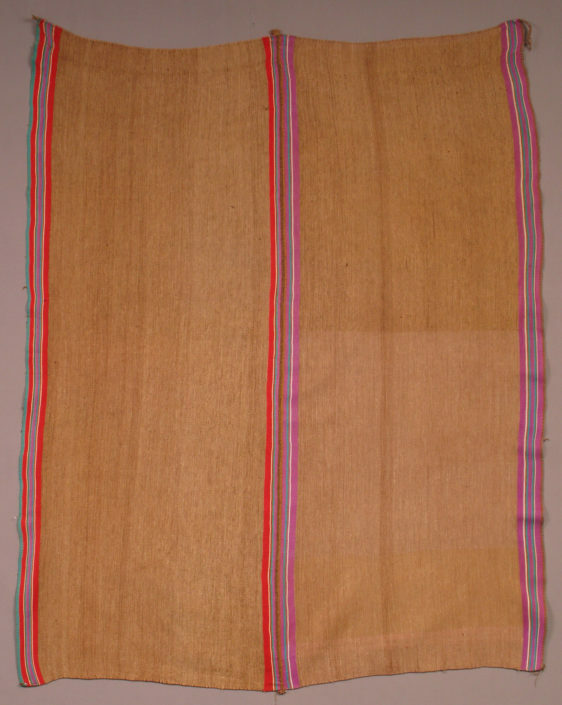 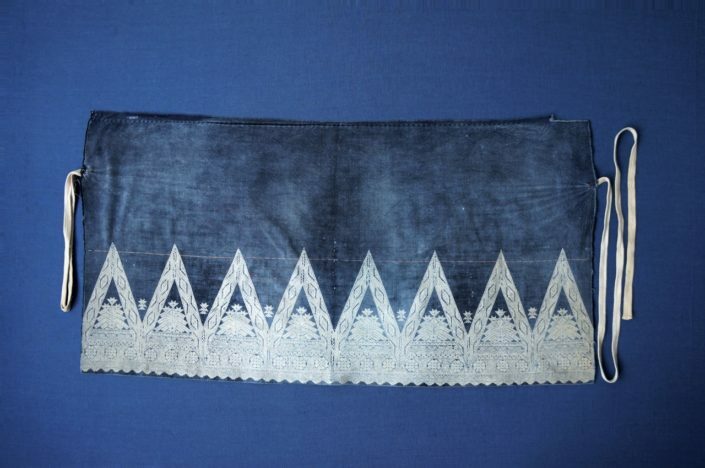 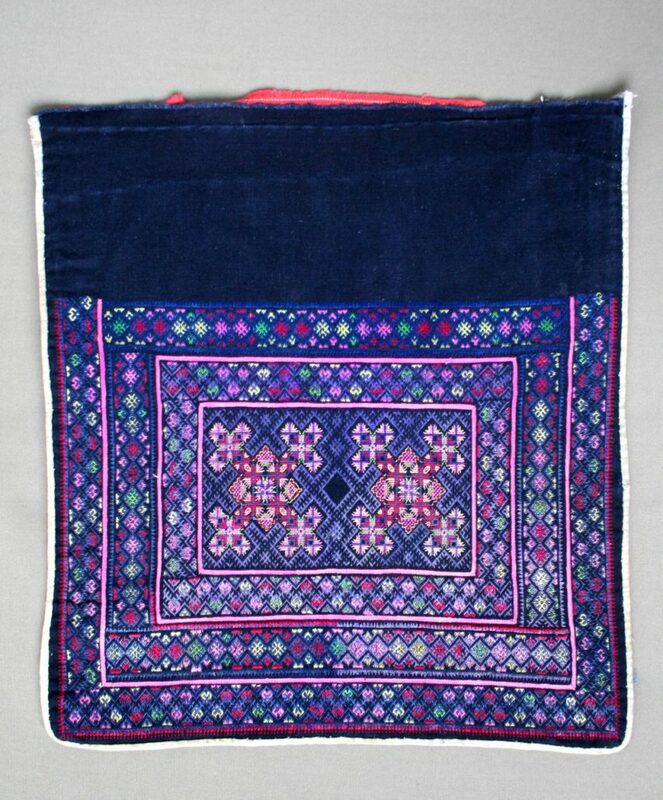 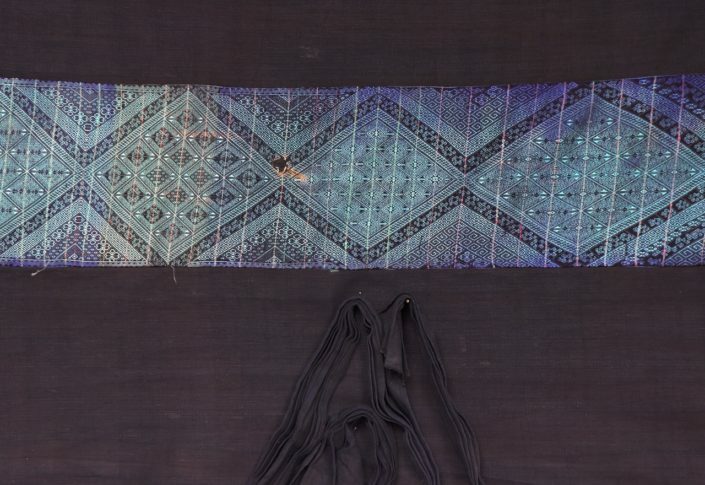 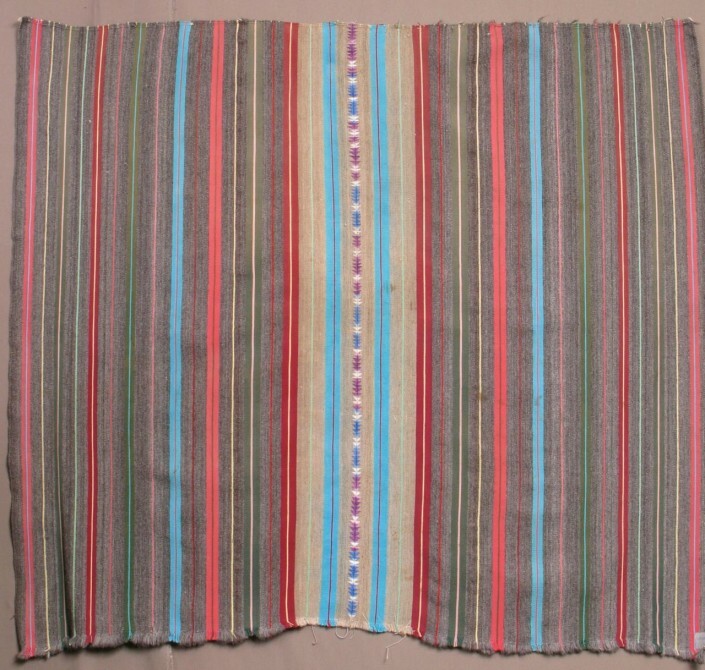 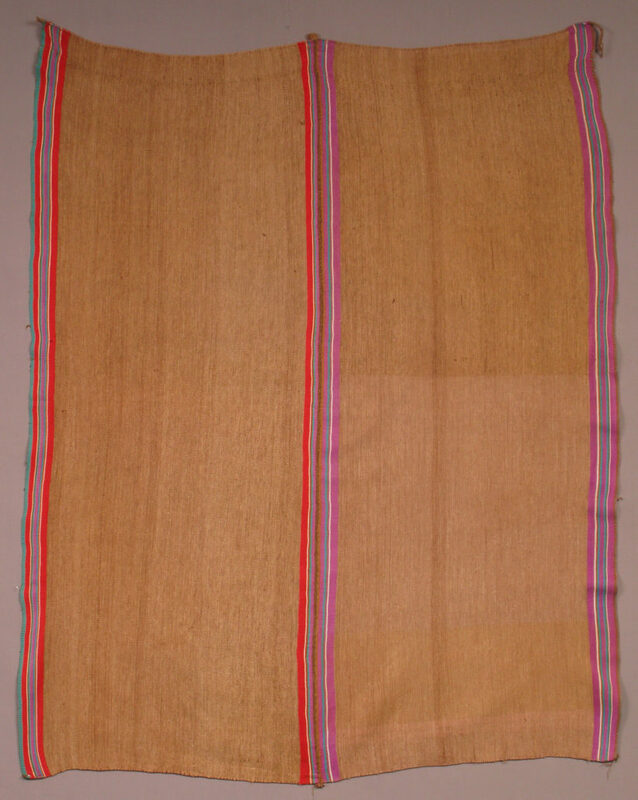 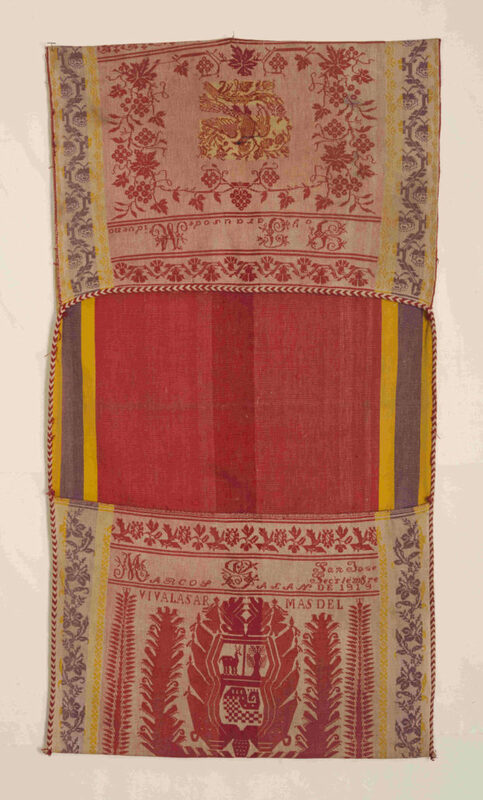 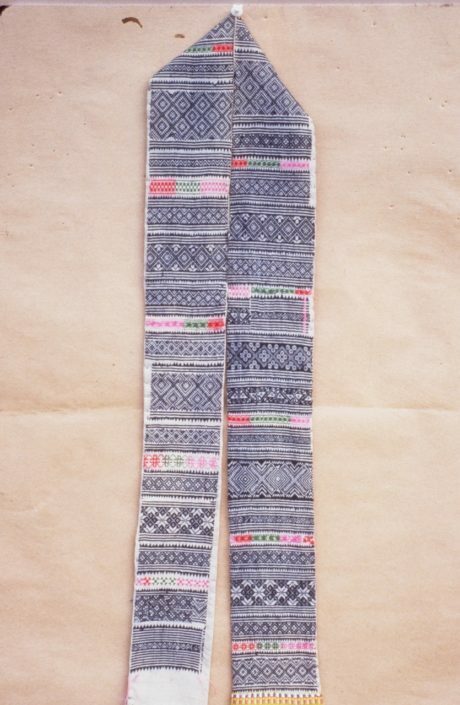 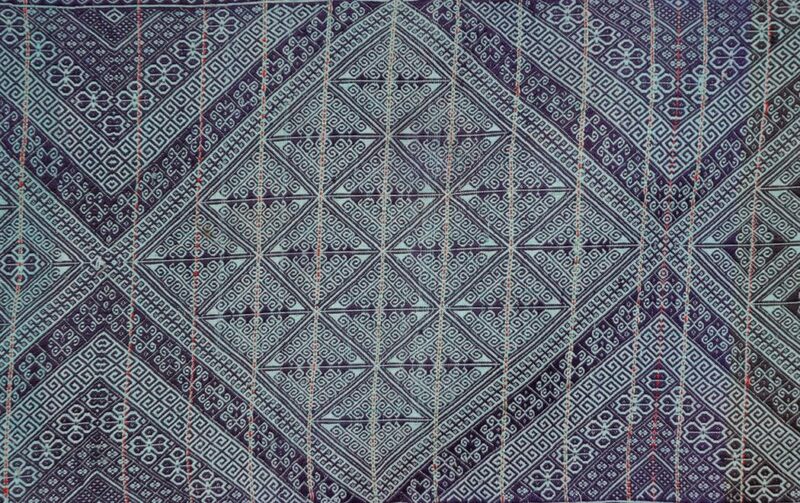 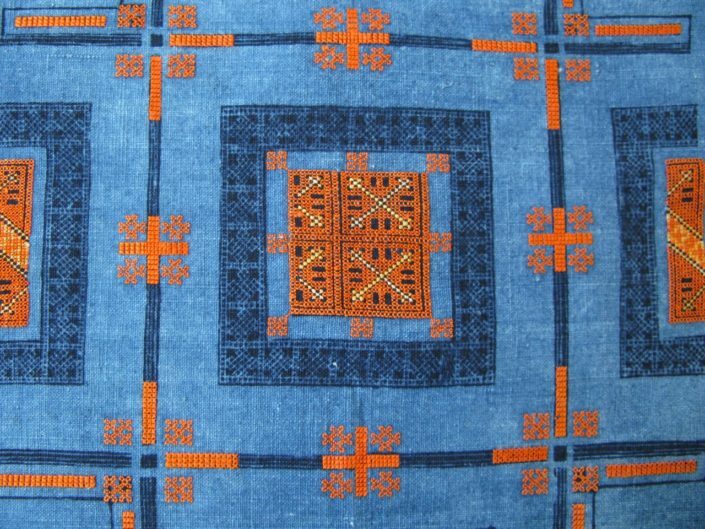 Warp ikat, often in indigo, distinguishes the sarongs from the western area. Strips of mica glint between the colored brocades of some small skirts which showcase multiple bands of symbols and anthropomorphic beings. 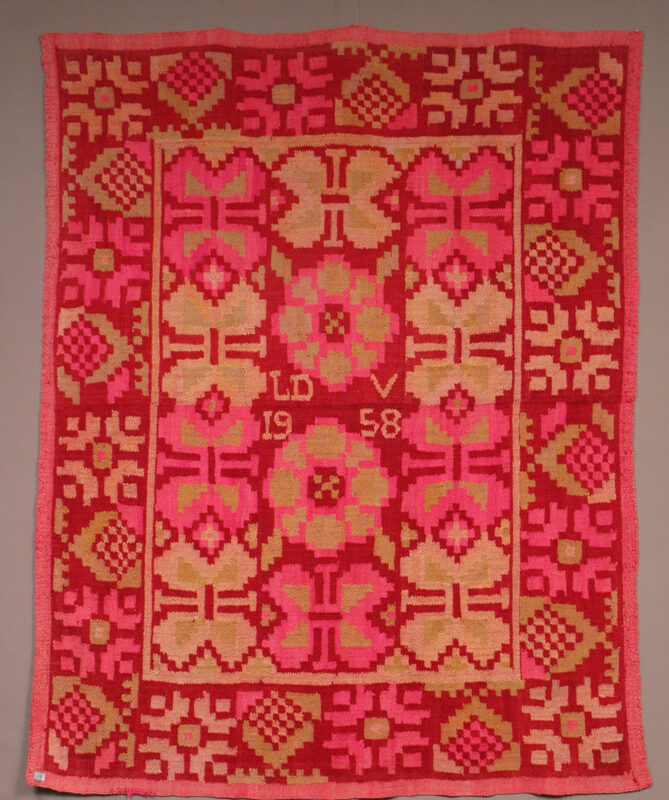 Embroidery is used to both outline woven elements and on its own. 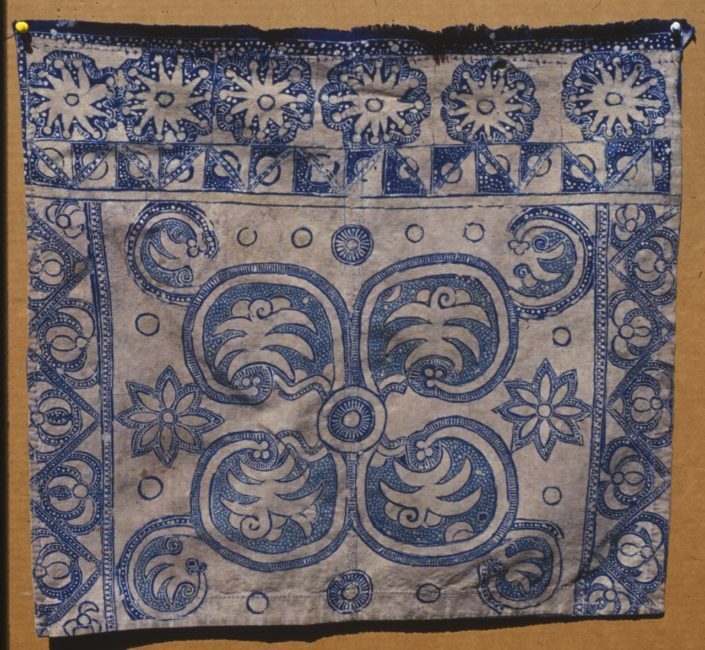 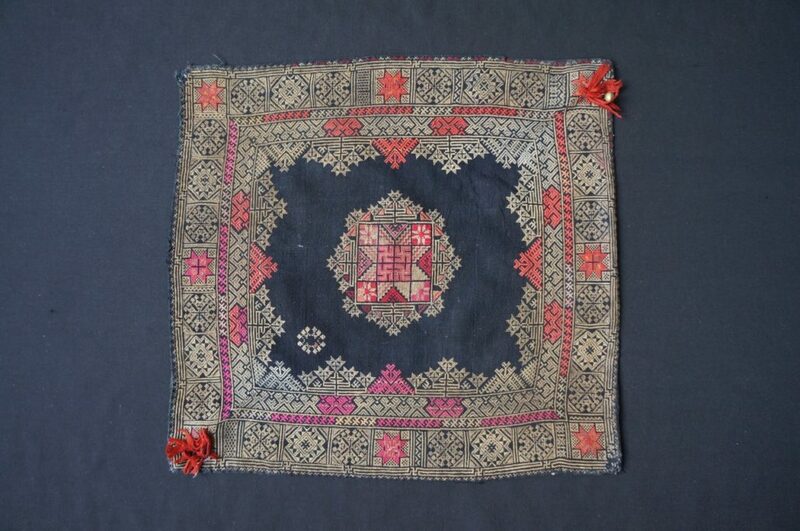 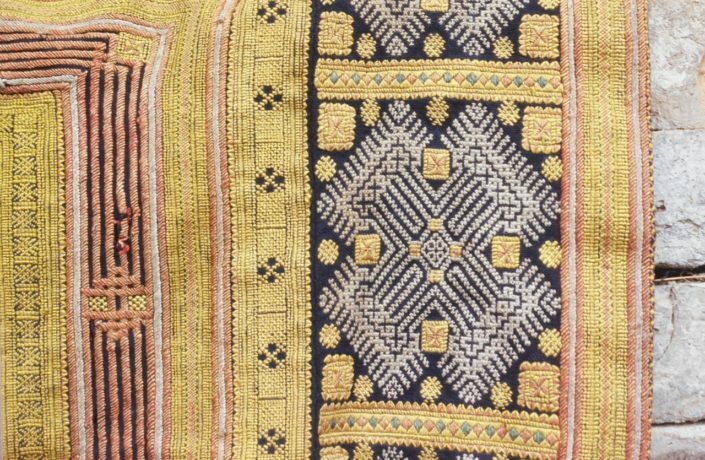 This rich sampling begs for comparison with textiles from other island cultures. 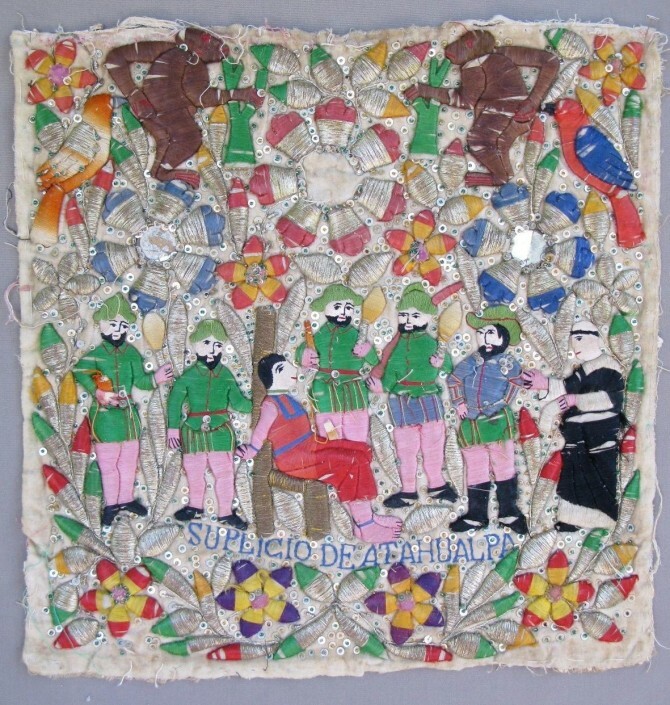 This is a very special collection of only nine pieces, including the embroidered items of both male and female costume with a pair of men’s leg ties. 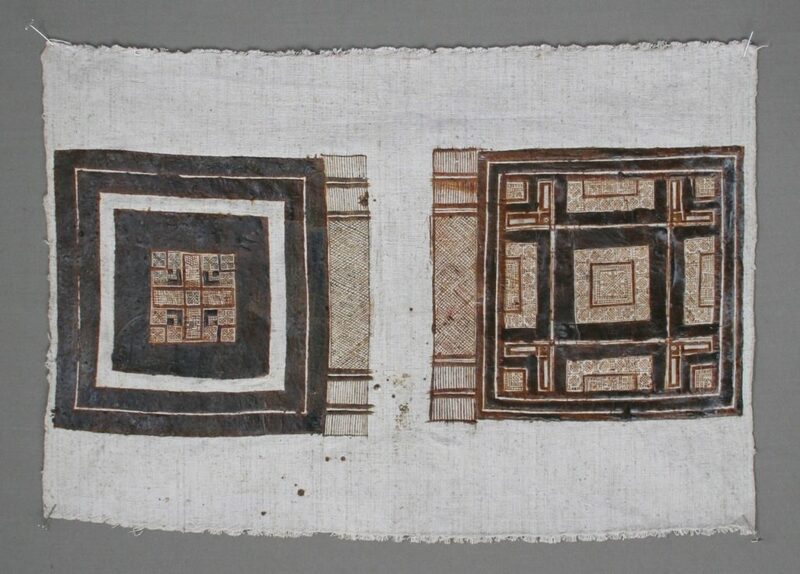 There’s also a shirt under construction and two textiles with the wax applied to the still-white cloth. 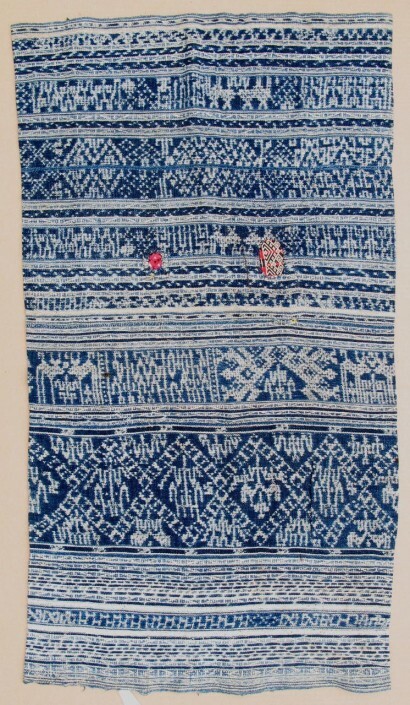 In this area designs were created by a batik process using indigo. 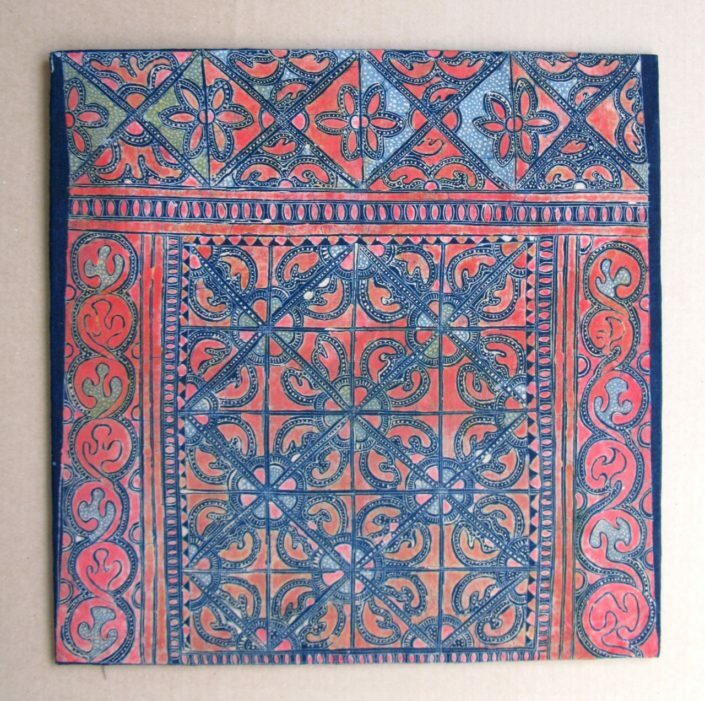 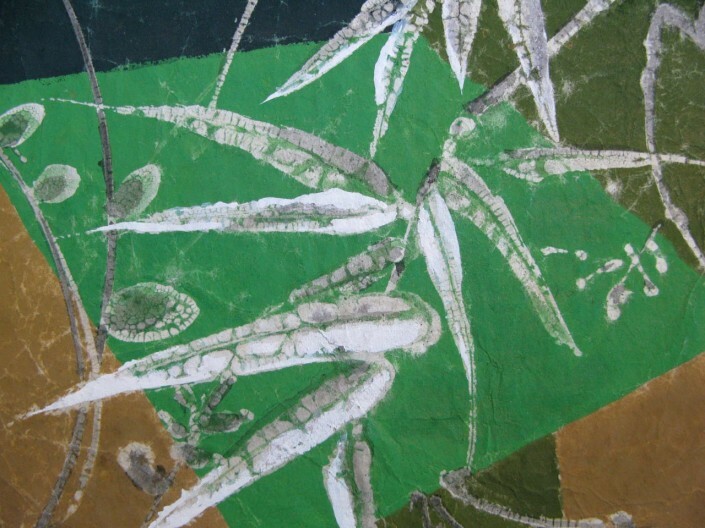 Some pieces were further embellished by application of red and/or yellow pigment to the surface. 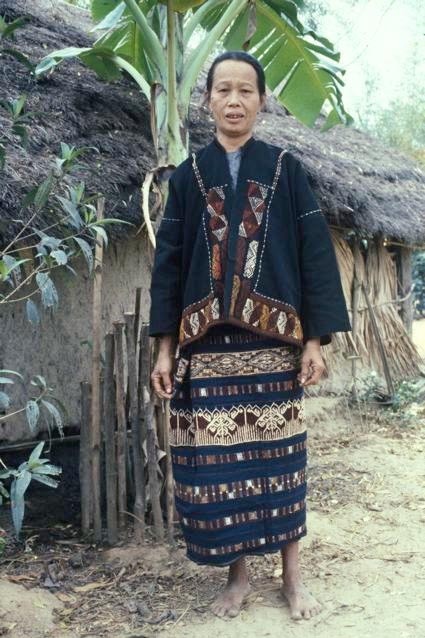 There are about 15 items in this group. It was the embroidery, again counted thread technique, which fascinated me when visiting these people. 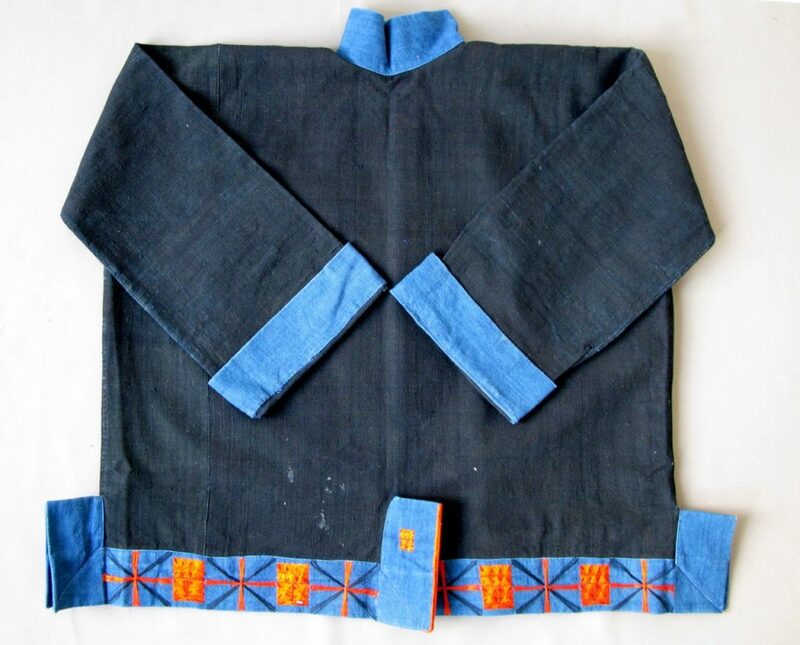 I admired the identity badges on the shirt back, and also the ties for the headpiece. 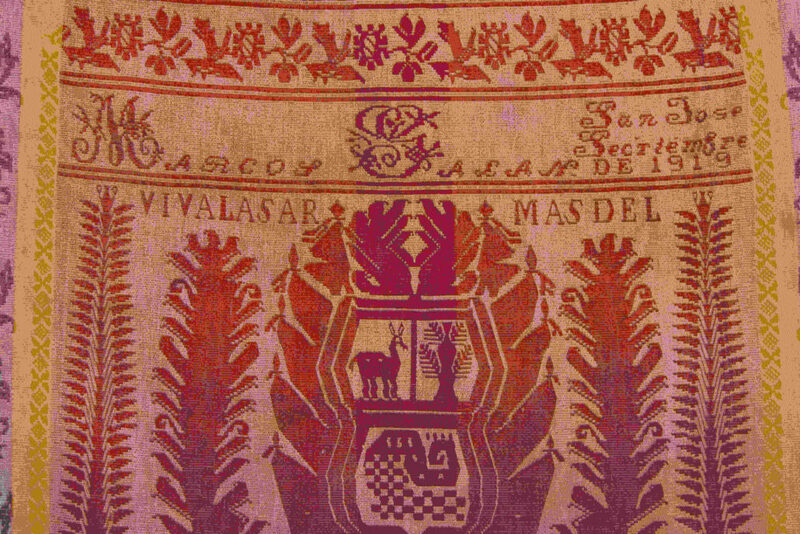 But most riveting was the story told by the apron panels. I could note the development of color from the grandmas’ dark red to the mothers’ bright red and onto the girls’ shocking pink. 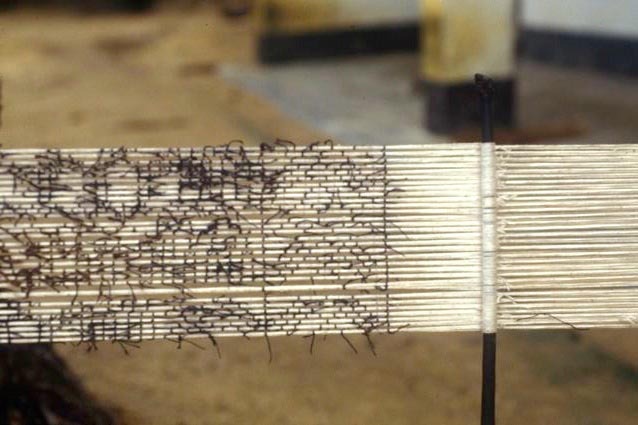 But the outstanding feature was the terrific ingenuity used in laying out patterns within the traditional confines of3-column outside framing a grid within! 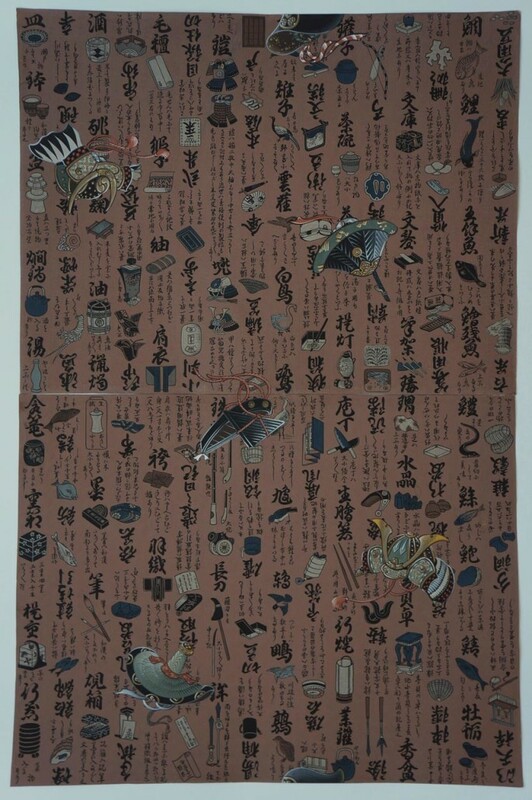 This is a complete collection of 47 pieces. 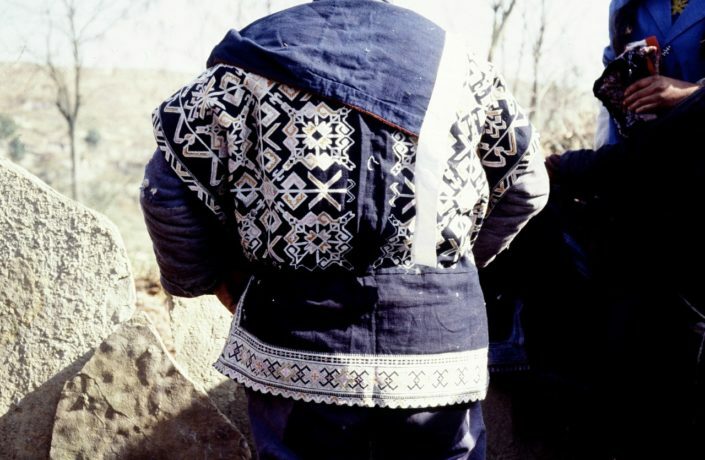 In this area, which I first visited in 1982, women used identical garments but embroidered in two distinct styles. 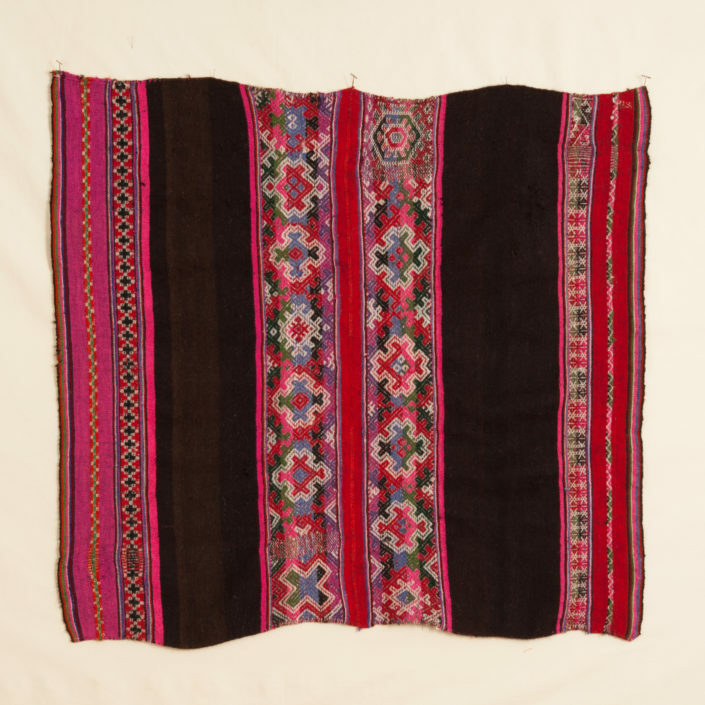 As with other minority peoples, sections were disassembled and recombined as needed by wear. Another feature of dressing here was that several layers of shirts were worn to show wealth. 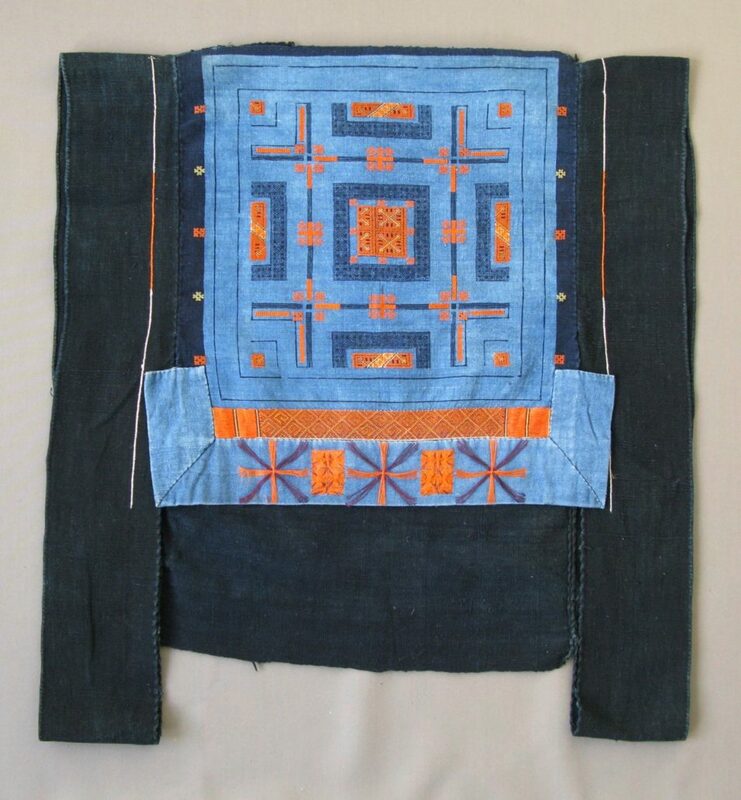 Fascinated, I returned several times during the early years of the 1980s, resulting in a collection of nearly a hundred items. 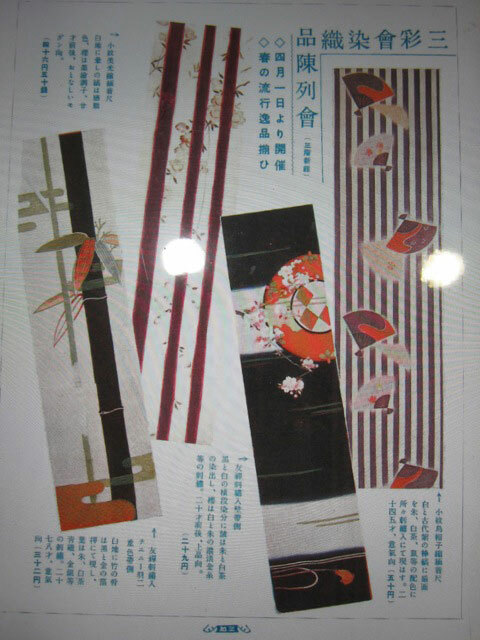 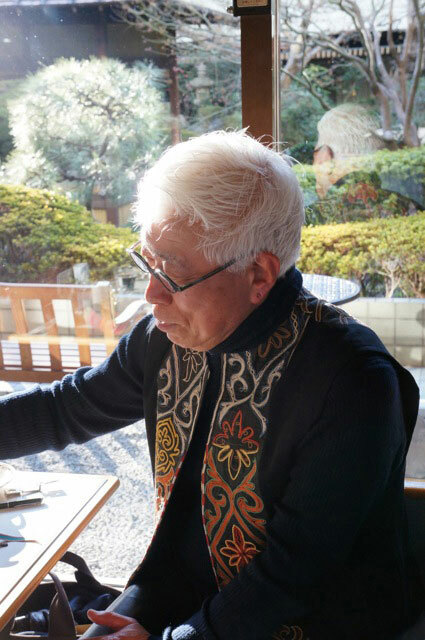 In 1983 I arrived for a three year stay in Japan, curious to learn more about modern kimono design. 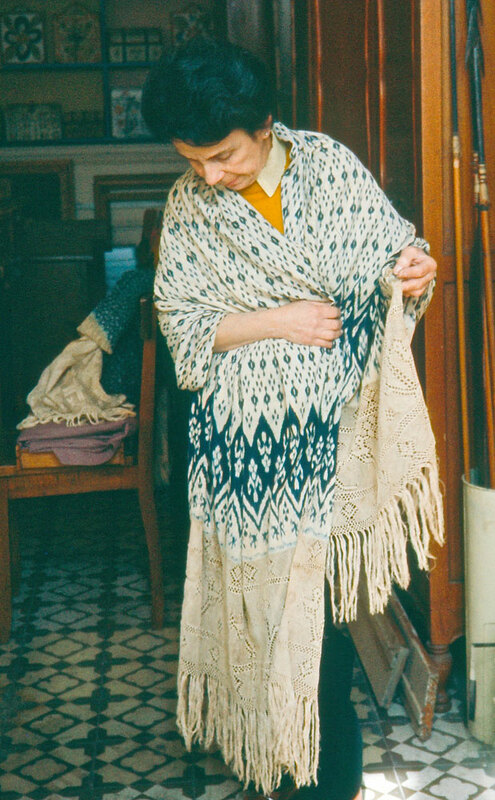 There was little published material at the time, so the bulk of my research was done in a most basic way: collecting material and showing it to informants asking about fiber, date and technique. 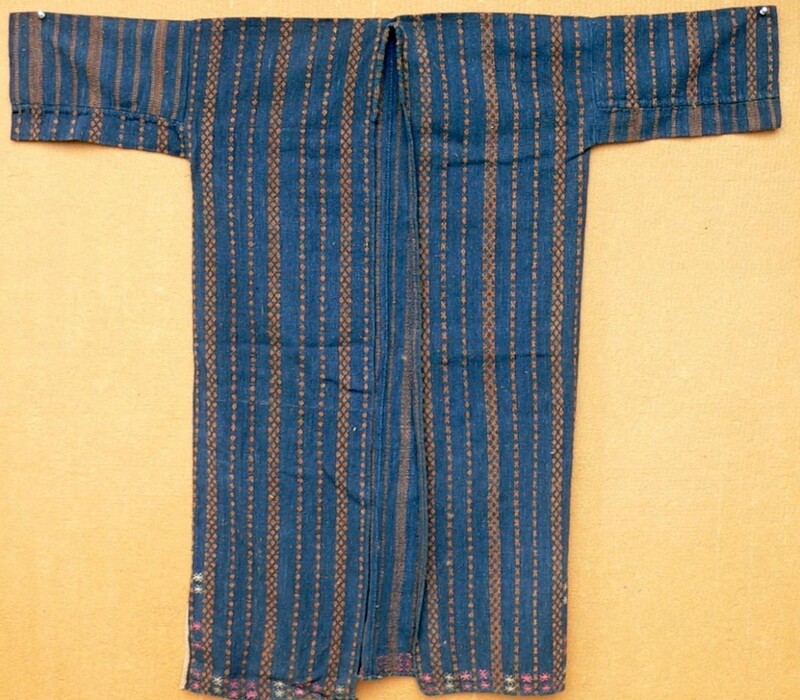 But this period coincided with the closing of many small Kyoto kimono companies as the market for such traditional wear lost currency; I was thus able to acquire a significant and wide collection of the original, hand painted life-sized designs, which I have kept intact. 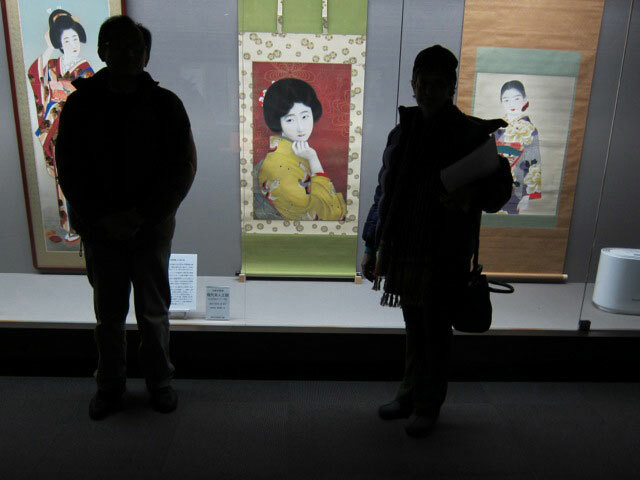 There are about 2,000 paintings, ranging in date from the late Meiji period to postwar. 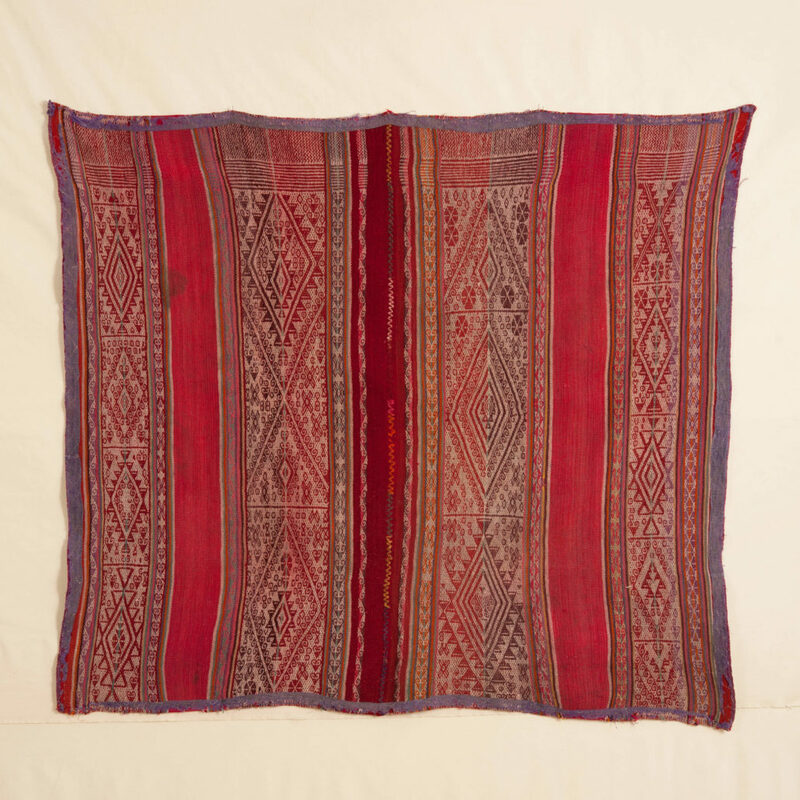 Some 650 of them have now been photographed and wrapped in archival material to preserve them. 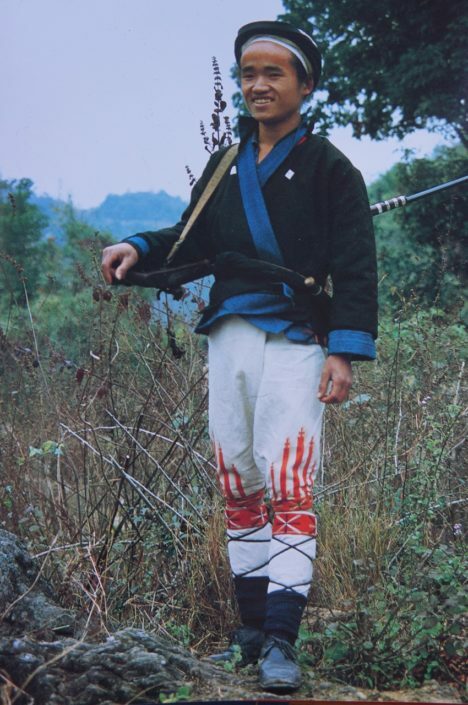 I’ve spent time in recent years showing these to a number of experts in Japan and find the story fascinating. 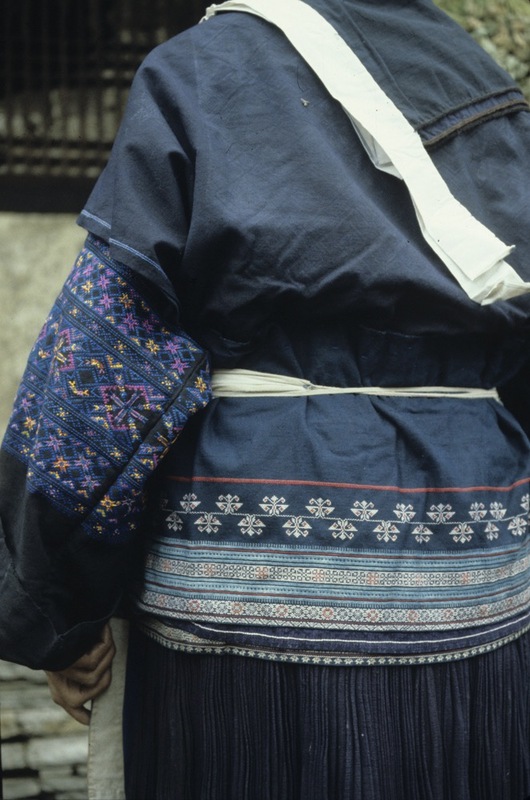 The early twentieth century was an exciting time in Japan as the national government tried hard to “catch-up” with the technology of the West. 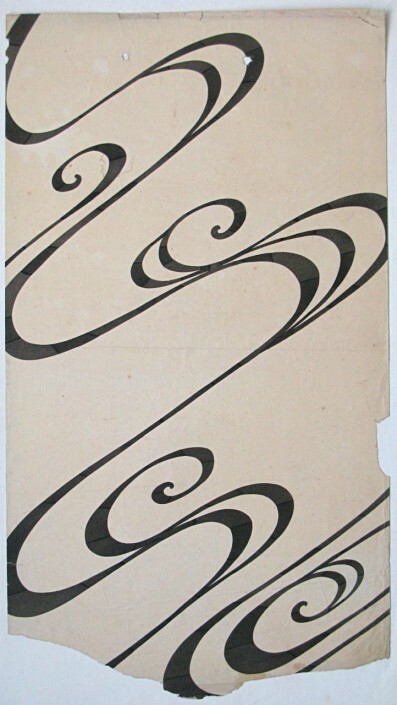 Modern influences flew fast in both directions. 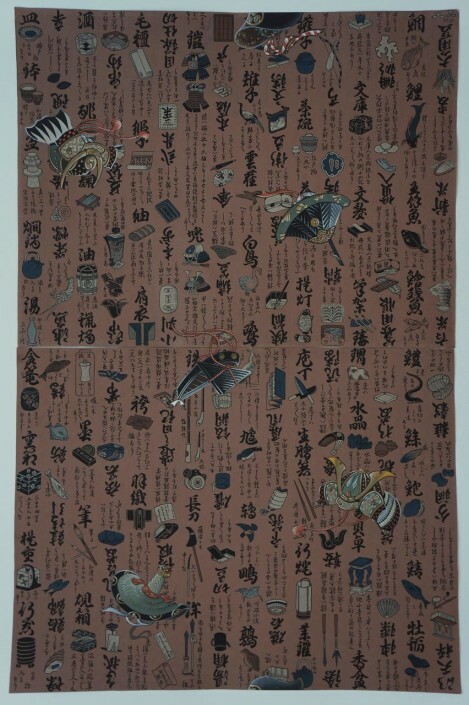 Alternating with nationalistic incantations of historic times were innovations in materials (from washi and sumi ink to gouache and commercial papers) and the stimuli of new marketing tactics as well as the introduction of two important new techniques: meisen, in which stencils were used to space-dye the threads to imitate kasuri and widespread practice of kata-yuzen, which enabled designs with vertical repeats to be produced in quantity and much more cheaply. 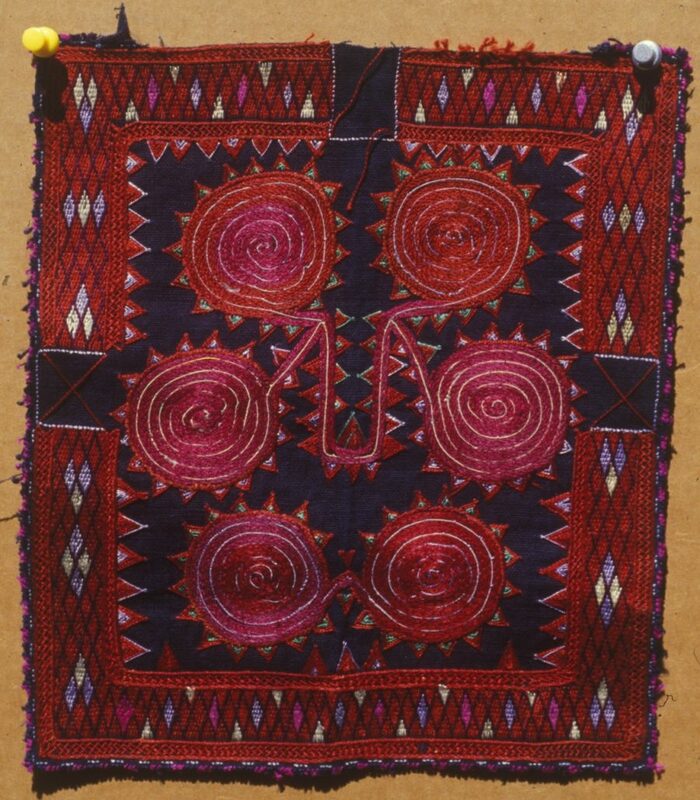 Finding no collections of comparable material available, researching and dating these anonymous works has been a creative challenge.